Why Aren’t You Training with Kettlebells? Why Aren’t You Training with Kettlebells? boredom-when you are no longer motivated to do the same stale workout week-in, week-out. Kettlebell training is a sure-fire way to conquer the boredom factor and rekindle that I-can’t-wait-to-get-to-the-gym feeling. If you haven’t already tried kettlebell training, waiting any longer would be ill-advised. You’re missing out! Kettlebells are indispensible tools to include in your strength and conditioning toolbox. Experience strength gains, improve core stability and challenge your cardiovascular system using this old-world piece of equipment. First things first-what is a kettlebell? For the uninitiated, a kettlebell is a weight that looks a lot like a cannonball-with a handle. Kettlebells are typically made from cast iron and come in a variety of different weights/sizes and sometimes feature different colored handles or other characteristics that make it easier to tell them apart. They can weigh as little as 5 pounds, and go up to about 100 pounds but kettlebell weight is commonly measured in kilograms rather than pounds. They typically start at 4 kg and move up in 4kg increments. Sounds like a dumbbell, right? Not exactly. A little kettlebell history never hurt. Kettlebell training originated in Russia. The first recorded mention of their use was in 1704, in a Russian dictionary. The Russian word for Kettlebells is "girya," and the men who lifted these weights were called "gireviks." In 1913, some 200 years later, Kettlebell training was featured in a magazine called Hercules and shown to promote strength and conditioning. Today, kettlebells can be found in most commercial and private gyms. In the U.S., Kettlebells exploded in popularity when Russian-born Pavel Tsatsouline introduced them to the United States. Tsatsouline, formerly a military trainer for the former Soviet Union and now a trainer for the United States armed forces, is also a successful author and the undisputed expert in kettlebell training. Kettlebell training took off in this country when U.S. athletes noticed their Russian counterparts using a training technique that resulted in superior muscular and cardiovascular endurance. They then began incorporating the kettlebell into their training routines. How are kettlebells different from dumbbells? The weight of a dumbbell is evenly distributed on either side of its handle so it’s easy to grip and maneuver. Its center of gravity is in the middle of the dumbbell, again, making it stable and easy to control. 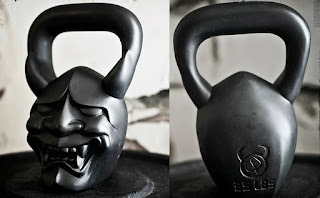 Contrast that with the kettlebell’s odd shape and off-center design, with handle on top, and the majority of its weight on the bottom which makes it inherently unstable and hard to handle; especially in the “bottoms up” position. This translates to a more unstable “environment” for the body. Exercises that create this type of instability recruit more stabilizing muscles that attempt to assist with controlling the kettlebell during movement. The next thing you know, you’re working your core muscles more efficiently and intensely than you realized. Dumbbells typically hold their users to strict, controlled movements that generally speaking, aren’t suited for exercises that utilize much explosive power. They are more commonly used to isolate specific muscle groups, but because they are free weights, they also work some of the stabilizing muscles, assisting dominant muscle groups. Kettlebell exercises are dynamic and often explosive, engaging many different body parts and muscle groups simultaneously. When the different muscle groups are engaged at the same time, provided a challenging weight is selected, the heart rate can be effectively elevated and a great cardiovascular workout can be achieved. Kettlebells target which muscle groups? As with any quality training technique, kettlebell training incorporates all major muscle groups. Focusing on multi-joint movements using kettlebells will involve core musculature to a greater degree than exercises like bicep curls that isolate a given muscle group. But couple that bicep curl with a squat and now you have a metabolically demanding exercise that challenges multiple muscle groups at the same time equaling more bang for your buck. Jessica Hershberg in her article on kettlebells at www.livestrong.com, says most people would likely benefit from starting with a kettlebell weight of between 8 kg and 16 kg. A good weight for a female beginning kettlebell training would be an 8kg kettlebell. However, women with more weight lifting experience and a greater level of fitness may opt for a 12 kg bell. A male at the beginning stage, will likely do best with a 12 or 16 kg bell, depending on his current fitness level. If you are familiar with weight training and already possess a basic level of fitness then 16 kg can be appropriate. If you are new to strength training, a 12 kg will suit your needs. Continuous kettlebell swings can impart a metabolic challenge of sufficient intensity to increase Vo2max. Heart rate was substantially higher than Vo2 during kettlebell swings. Kettlebells provide a useful tool with which coaches may improve the cardiorespiratory fitness of their athletes.₁ “We don’t have to do traditional cardiovascular training (running, cycling etc) to get a cardiovascular training effect,” says Cosgrove. “Twelve minutes of kettlebell swings can be used as a great cardio tool, as can bodyweight circuits, sleds, sandbags etc. Taking that a step further, we can see that it may actually be a better choice of cardio training for some people; particularly those with orthopedic injuries that prevent them from doing explosive movements with varying degrees of impact. 12 minutes of running as a comparison obviously involves a lot more repetitions through the joints than an average of 265 reps of kettlebell swings. So for some people, we can get a similar metabolic effect, heart rate, oxygen consumption (and therefore calories burned) while reducing the total reps and joint stress in de-conditioned clients. 1. Kettlebell training is not the same as weight lifting. 3. Focus on the movement, not the kettlebell. 4. When it comes to this technique, fundamentals will take you far. 5. Girls: Don’t bother with tiny little kettlebells. If variety is the spice of life, kettlebells are definitely the pepper. Sources: Farrar, RE, Matthew, JL, Koch, AJ; J Strength Cond Research. 2010 Apr;24(4):1034-6.